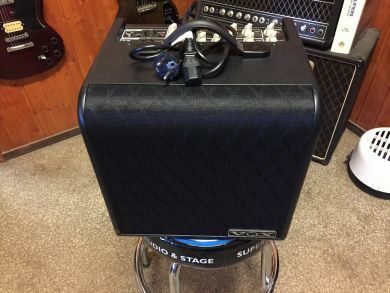 The Vox AGA70 is only the second Vox amp designed specifically for acoustic guitar amplification, the first being in the mid 1980's. The AGA70 is a true two channel amp, with one 1/4" input jack (for guitar) and one XLR input jack (for microphone) per channel. 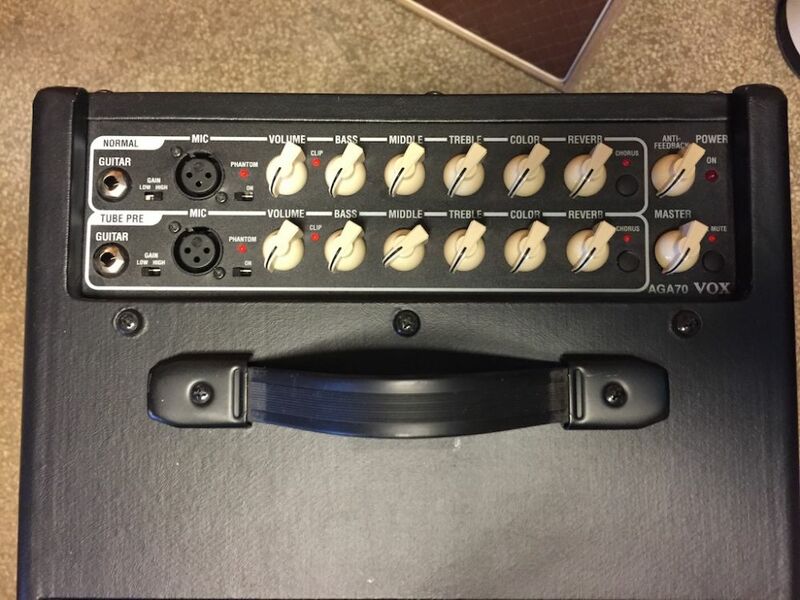 The XLR input jack offers switchable Phantom power if required. The first channel is solid state, the second channel has an ECC82 preamp tube. 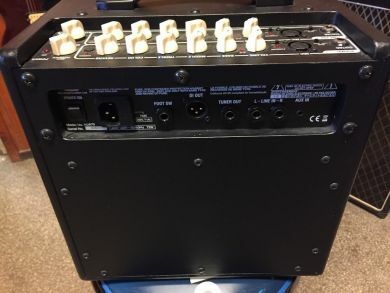 Total output power is 70 watts RMS. In addition to Volume, Bass, Middle and Treble controls in both channels, the AGA70 also has a "Color" control. The "Color" control is a sweepable frequency parametric tone control, somewhat reminiscent of the "Tone X" controls on 1960's era Thomas Vox amplifiers. The AGA70 also includes variable reverb and selectable chorus. An Anti-Feedback control may be adjusted to suppress feedback through the use of variable frequency notch filtering. Dual line input jacks allow a keyboard or other instrument to be connected to the AGA70. A stereo mini input jack allows a MP3 player to be connected to the AGA70. This feature might be used to amplify a backing track or to provide break music during an intermission. A DI output (balanced XLR) is provided to allow the AGA70 amp to be connected to a larger sound system, if necessary. A 1/4" audio output jack is provided on the rear control panel for easy connection to an external guitar tuner. A single 6.5" Vox speaker powers the amp.